We've done a flurry of transmissive profiles for different customers in the last few weeks, and it occurs to me that this might be an area of profiling that not too many people know about. Readers of this blog will be familiar with calibrating and profiling a display - which results in a monitor profile. 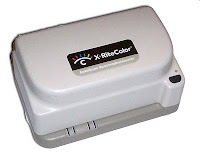 Also, you can use a device that measures reflective color to make a printer profile. But a different flavor of printer profile is the transmissive profile. Instead of working with material that is intended to be displayed using some kind of light illuminating the front of the image, you can make a profile that is specifically for an image that will be lit from behind - back lit, and the color you see from this material is transmitted through the media. People who use transmissive profiles are usually printing onto transparent or semi-transparent film for display purposes. While it is technically possible to print onto film like this using a normal, "reflective" type profile - this will not normally capture the effect of light passing through this media. Especially for film that is less opaque, the effect of a light source transmitting through the semi-clear media and through the ink can best be captured using a spectrophotometer that is specially made for this purpose. And there are not too many of those around. At CHROMiX we use an X-Rite DTP-41T which is a specially modified DTP-41 that can measure transmissive light - and also can read entire strips of color at a time, rather than single colors at a time. Believe me, large targets can get very tedious one color at at time! Barbieri also makes a couple of models of spectrophotometer which can measure entire sheets transmissively. Even better! Judging by the volume of transmissive material we profile, we might be the only commercial profiling provider around that offers this service. If you'd like more information on this, contact sales@chromix.com or techsupport@chromix.com or call 866-CHROMIX.